In today’s Almond Matters, brought to you by Valent, with the year wrapping up almond growers are preparing for their important winter sanitation programs. As almond trees go dormant for the season it’s an essential time to get going with preventative action to prepare orchards for a successful season next year. Even with increased action taken against navel orangeworm in recent years, Lopez noted that the pest is continuing to become more of an issue for growers. 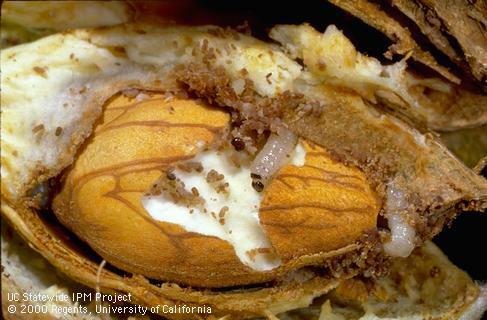 Navel orangeworm can affect several other crops aside from almonds, and as food sources increase navel orangeworm populations have also continued to rise. “As the acreages increase the problem has increased as well,” said Lopez. Keeping orchards clean and free of mummy nuts is an integral part of sanitation programs. Ensuring the mummy nuts are shaken off the trees and onto the ground helps eliminate food sources for overwintering pests. “Make sure that we destroy the navel orangeworm and then disk them under the soil so that they rot. Hopefully, we will have a normal, cold winter and rainy winter which helps deteriorate the nuts and therefore eliminate the food source that these critters have over the winter and that helps us with control,” said Lopez.